Created by US toy giant MGA Entertainment, Lalaloopsy rag dolls were originally known as Bitty Buttons. These eight inch tall characters carried the tag line “Sew Magical – Sew Cute”. Each one was made from a different design and fabric that reflected the day of her birth. As well as Crumbs Sugar Cookie, other characters included Peanut Big Top and Pillow Featherbed. A succession of new Lalaloopsy dolls continue to be released by MGA, much to the delight of all the brands girl fans. As well as rag dolls with enchanting names like Pickles BLT and Pix E Flutters, a large range of playsets and vehicles are also very popular, especially the Treehouse Playset and RC Cruise vehicle. 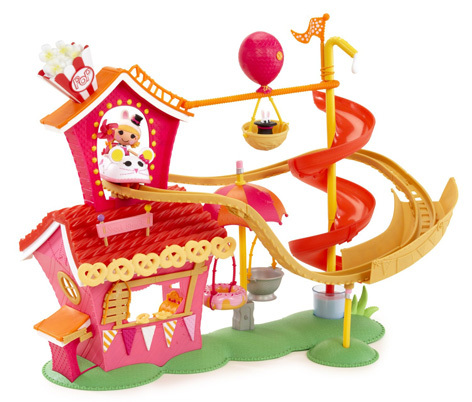 Lalaloopsy micro figurines also have their own play environments, and are especially liked because of their lower price points. Books, stickers and even girls pyjamas can all be purchased decorated with Lalaloopsy characters. Never a company to stop creating new products, MGA introduced the loveable Lalaloopsy Babies. All four of the original characters have been transformed into cuddly soft dolls that come complete with a dummy and bottle as well as a different character hat for each one. Fans of Laloopsy dolls will want to check out the Babies versions of Jewel Sparkles, Crumbs Sugar Cookie, Mittens Fluff ’N’ Stuff and Pillow Featherbed. If that wasn’t enough excitement, the Lalaloopsy Bubble Mermaids contain a solution that magically makes their hair grow when the body is squeezed. Little girls can then shape and design a new fun hair style to match their moods. Pearly Seafoam and Ocean Seabreeze also each come supplied with a little pet that can squirt water out of its mouth when played with in the bath. The large Lalaloopsy characters have some extra friends in the shape of Cherry Crisp Crust, Smile E Wishes, Mari Golden Petals and Yuki Kimono. Fans of these gorgeous dolls are sure to want to collect all of them! If kids want to go smaller, then Lalaloopsy Littles are the perfect solution. Mimi La Sweet, Spoons Waffle Cone, Twirly Figure Eight and Tiny Might may be small but they have big personalities. Each one is supplied with its own little pet whose personality is reflected in the material that it’s made from. Liitle girls may also want to watch out for Mini Lalaloopsy Silly Singers. These low priced toys dance and sing on your hand after pressing their tummies! Four versions are available - Pillow Featherbed, Jewel Sparkles, Crumbs Sugar Cookie and Peanut Big Top. A series of Lalaloopsy Ponies are also available. Varying in size from 8-13 cm tall, they all have attractive hair that can be styled by using the supplied brush.